In full disclosure, I didn't read Harry Potter until I was expecting Rachel and the seventh book was coming out and Andrew was so incredibly excited about it that he preordered it. So I figured it was time to see what all the fuss was about. The only problem was that I thought the first book was a little bit...boring. I simply hadn't been able to get into it no matter how many times I picked it up. Andrew instructed me to start with the third book, which is one of his favourites: it's much shorter (and less intimidating) than the later books but is a little more captivating than the first book. So that's what I did. And then I read 1, 2, 4, 5, and 6 in rapid succession and was all ready for book 7 when it came out. Or at least, I would have been ready had I not been busy doing other things...like having a baby. Rachel was born on July 20, 2007. Harry Potter 7 was released on July 21, 2007. Andrew and I disagree a little about when the book came, precisely. He claims it came a day early, that the package was delivered to our doorstep, quite literally while I was birthing Rachel, that he went home to get it, and that he read it that first night at the hospital (and that all the nurses were reading it, too). I'm pretty sure, however, that he didn't go back to our apartment the night Rachel was born. I think he camped out in the hospital room feeling too shell-shocked to do anything else until the morning, when he decided to run home for a shower, shave, and fresh set of clothes. As evidence, he was wearing his (favourite) orange shirt on the day she was born, and is clearly not wearing it in the picture below. Whatever the case, he returned to the hospital with a brand new copy of The Deathly Hallows as giddy as a school boy, snatched Rachel from her bassinet, and settled on the couch in my hospital room, declaring, "This is the best day of my life!" And all the nurses were reading the book as well. 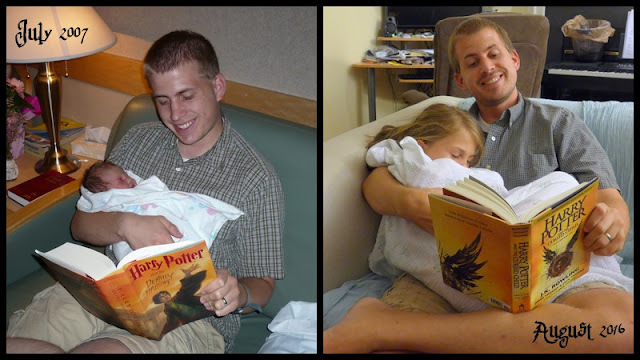 Yesterday our copy of Harry Potter and the Cursed Child finally arrived and Andrew mentioned wanting to recreate that picture of him with Rachel from nine years ago, so I went to Rachel with the idea to test the waters. "No way!" Rachel declined. "Why doesn't he just do it with Zoë or something?" "Because he wants to do it with you. Come on, it'll be fun." "Because it's embarrassing! I wouldn't ever want anyone to see it!" We talked about controlling the narrative, and how it's not embarrassing if you're the one leaking the photo. If you put the photo out there and say, "Haha! Look what we did! Aren't we clever?" then it's no longer embarrassing; it's just funny. She still wasn't convinced, so I took her on a little journey online to look at a bunch of recreated photos from years gone by. She found them hilarious, but was still worried about the embarrassment factor. I assured her that not a single one of those willing participants was embarrassed by those photographs. However, to be embarrassed you have to be made to feel awkward, self-conscious, or ashamed, and that is quite impossible to do if you confidently recreate a photograph and brazenly post it online for all the world to see. If you embrace a situation—even if it's something silly—then you can't be embarrassed. All you can be is awesome. See, Rachel? That wasn't so embarrassing, was it? They're such a handsome bunch. And they're already planning on remembering to recreate this photograph in 2026. Because that would be hilarious and not remotely embarrassing (except, perhaps, for Zoë (it might take a fair bit of convincing to get her to pose like that in ten years)). On facebook Andrew captioned our recreation photograph as "3291 days later," and I said, looking at the new picture of him holding all four kids, "When you put it that way, no wonder we're tired! We've done a lot in the last 3291 days!!" We've had three more babies, graduated from school three more times, and moved three more times,* all in 3291 days...give or take (because I'm pretty sure Andrew's timeline is off by a day). And now I need to stop writing and start reading because I'm first in line to read this book, and then it's Andrew, and then Rachel, and finally Miriam, who, incidentally, came home from school yesterday waving Harry Potter 7 in the air and squealing, "I finished it! I finished it! I finished it!" Her first time through the series; I'm so proud. If I don't finish this book quickly someone's going to steal it from me! * Good things come in threes, apparently. I held out on HP for a really long time, too, Myrna... Don't remember when exactly it was that I finally read them, but they really are fun. So, what did you think of the book? A friend posted on FB that her three children read it in a day. I'm curious if their thoughts of it match yours. Do you think it was worth it. I went to buy it but the reviews were so mixed. It seemed like 30% of people were just super grateful to have anything else Harry Potter to read and 30% felt like it was terrible.. Ruined everything. And then the rest of the people spread out fairly evenly from there. What do you think? Worth it or no? And J.K. Rowling did not really write it, either...she is just making more money. I don't like the commercial vehicle that HP has become. Eva Ibbotson--her books are so good, but not commercialized, and J.K.R. most likely got her idea for 9 3/4 from Platform 13 of Ibbotson. Which Ibbotson did not mind, so I can't mind either. But I think that HP has been propelled along by some fabulous marketing that other authors and characters have not enjoyed. Which I guess is why I don't read it. Also, I didn't really like the movies, honestly. Too dark. And yes about the movies being dark! I found the books to be much easier to handle that way - the movies gave me nightmares if I watched them after dark (and I was in my late 20s/early 30s before I saw them all). I have to check out Eva Ibbotson. I'm always on the lookout for new authors for Grace...she gets so frantic feeling when she thinks she is going to run out. I tell her, "Girl you can read anything." I used to tread cereal boxes at breakfast, my parents junk mail, my science book when I'd run out of new reading material (even today our house is littered with medical journals and they are my primary bathroom reading...back while Jason was doing his PHD it was teaching journals...that is just how I role) but she has higher standards then I do. She is really into the Magic Thief series right now. I've had to buy the books because our library can't get them out to us soon enough and she is drying to start the Magyk series but they never have the first three books at our library. She's also started reading Nancy Drew because I told her it will take a bit to get through that series. She spends a lot of time running around outside so she doesn't read quite as fast as Rachel. Thank goodness because I can barely keep up with what she does read. Ezra still will only read books that are funny and irreverent or stuff he is forced to read for school. So thanks English teacher for making him read Around the World in 80 days, the Long Road Home, Sherlock Holmes the Hounds of Baskerville, A Wrinkle in Time, and Midsummer Nights Dream because if it was up to him it would have been only funny books all the time. Wow! So much chatter about Harry Potter! :) Where to begin? I don't think reading Harry Potter will ruin a child's appetite for other literature. Anecdotally, my girls have read the Harry Potter series and also enjoyed Boxcar Children. Sure, they probably enjoy the Harry Potter world a little bit more (Rachel has read the series six times), but that doesn't mean they didn't appreciate Boxcar Children. They totally did. Reading huge tomes gets tiring, so as much as they love HP, they also love reading shorter books as well. They've read (and loved) Nancy Drew and Little House on the Prairie and Weird School and so many other series as well. I think reading a wide variety of literature is good, like eating a balanced diet. Harry Potter helped reintroduce the joy of reading to so many children and I'm happy to have such a wonderful bit of literature for my children to enjoy. Now that we've both read it, we talked with the girls about it and how to read a script. Their experience with Chitty-Chitty-Bang-Bang helped them to understand acts and scenes and settings and lines. We talked about how a lot of the story is left untold and how it's up to the director to creatively fill in the blanks, which is why a lot of the "detail" that you'd find in a novel, for example, is left out of a script. They seemed cool with that. It's shorter than a novel, so much quicker to read through. So if kids like HP in general, this might be a good way to get them to read more (if the thicker books were too much). And so great for a "popcorn" read at school, promoting reading out-loud. Think of how fun this would be as a reader's theatre (so fun)! Miriam's taking her turn with it first but Rachel was still interested in reading a play (such an interesting idea all of a sudden) so she pulled A Midsummer Night's Dream off the shelf and started reading that before bed. So, even though The Cursed Child is a Harry Potter story it didn't kill my children's desire to read any other manuscript. If anything, it kindled a desire to read a new medium of literature. Ibbotson's books are wonderful, and I'm sure Rowling drew inspiration from them (as well as from many other sources) because that's what writers do. No invention is dreamed up in a vacuum; as Ibbotson herself said, "I think we all borrow from each other as writers." I don't think that Rowling is in this for the money at all at this point. Is she filthy rich? Certainly. But she's also quite philanthropic. Her charitable giving, for example, kicked her off Forbes' billionaire list (see here), and while her stories have been marketed up the wazoo, I'm sure she sees a lot of luck in her discovery (as Europeans are more prone to think (granted the UK isn't all that different from the US on these polls, but Rowling's childhood hero is <a href="https://en.wikipedia.org/wiki/Jessica_Mitford>Jessica Mitford</a> who is rather leftwing, so it's likely Rowling is as well)). About being wealthy, Rowling said, "You have a moral responsibility when you’ve been given far more than you need, to do wise things with it and give intelligently," and I think she's done just that. She's started a few charities, herself, focusing on relieving the suffering of impoverished children. I think that speaks volumes to her character. And I completely agree with Heidi about books being commercial vehicles. I've gone to a few lectures on breaking into the "being published" world and that's the essence. You need a memorable character that's set for a series and would make a good show or movie or doll or something. That's part of what makes writing (with the goal of publication) is so intimidating...for me. That is true about the commercialization--that was why Scholastic had Vicki "dumb down" her unicorn books: because they wanted to market them with little unicorn necklaces, and they didn't think that would work with the YA market (the audience Vicki had in mind). I am not in any way AGAINST HP and his world. I just think it has been commercialized SO MUCH, and that just makes me want to not read it. But the rest of you--enjoy! I will just sit here reading my cereal boxes and encyclopedias and junk mail. (Who knew that Crystal and I had this in common! If there are words, then read it!) I think that you are right, Nancy, about the possibilities given the play format. Cool that Rachel picked up some Shakespeare to read!